This tai chi class is beneficial for people who want to work on their balance or improve their mobility after an injury. It targets all the physical components needed to stay upright, including leg strength, flexibility, range of motion and balance reflexes. All of this is accomplished with low-impact movements that are easy on the joints. 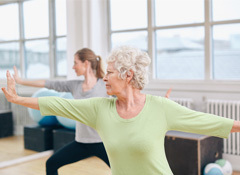 Tai Chi can help in the recovery process following a stroke, surgical procedures or other injuries. It can also benefit people with heart disease or those who experience tiredness, stress or have a high risk of falling. Classes consist of various standing movements and postures and can be adapted for students in wheelchairs or with other disabilities. A discount is available if you enroll for six class dates at a time ($5 per class). Please call 1-800-82-SHARP (1-800-827-4277 ), Monday through Friday, from 7 am to 7 pm, to take advantage of this special rate.